Long and low often means back problems for doxies. Even people who don't know much about dogs recognize your dachshund. His low, long back is the hallmark of your beloved wiener dog. However, this outstanding physical characteristic, a sign of his badger-hunting heritage, often results in serious spinal issues. The good news: effective spinal therapies are available. Your dog's intervertebral discs consist of cartilage surrounded by fibrous tissue. The University of California at Davis College of Veterinary Medicine compares the disc to a Tootsie-Pop: firm on the outside and soft in the middle. It acts as a cushion between each two consecutive vertebrae in the spinal column. Doxies are prone to thoracolumbar intervertebral disc disease, which results in an inability to walk as a disc herniates. Often referred to as a slipped disc, this condition can occur anywhere along the spine, but occurs most often in the middle of the back, according to the Virginia-based Veterinary Surgical Center. Symptoms include back pain, hind leg weakness, back arching and lack of coordination. Complete paralysis is also a possibility. 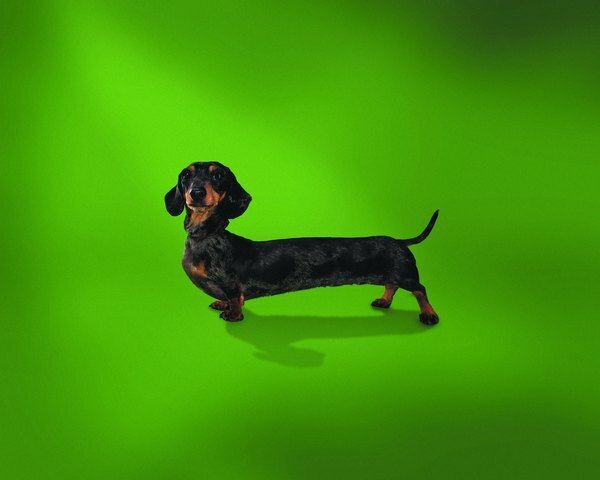 If your doxie displays any of these symptoms, take him to the vet at once. Thoracolumbar intervertebral disc disease requires surgery to remove parts of the disc pressing on your dog's spinal cord. Called a laminectomy, it consists of an incision in the back in which the veterinary surgeon uses a special drill to make a hole into the verterbra above the slipped disc. She then removes the disc material. Expect your dog to be in the veterinary hospital for up to 10 days. He must recuperate quietly for a month to six weeks. Most dogs regain full use of their legs. Future management includes dieting for overweight doxies, gentle exercise and elimination of jumping up on furniture or stair climbing. Your vet can recommend additional therapies. 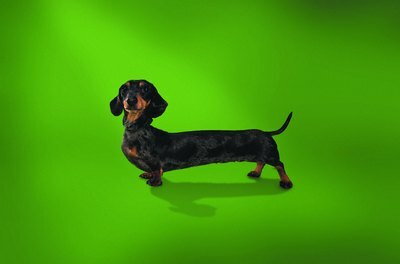 According to Veterinary Practice News, doxies outnumber other breeds "by a significant margin" in diagnosis of thoracolumbar intervertebral disc disease. Laser therapy, in conjunction with other treatments, offers pain relief and restoration of nerve function, among other benefits. Since laser therapy is relatively safe, with less trauma than conventional surgery, it's increasingly used as therapy in TIDD cases. The laser's light wavelength aids in promoting healing by allowing cells to repair more quickly. It also allows them to reproduce faster, which speeds healing. A year-long study by the University of Florida College of Veterinary Medicine involving 34 dogs, 75 percent of which were doxies, compared those treated with laser surgery to a control group that did not receive laser therapy. All dogs in the study were initially unable to walk, with some no longer able to feel pain in the back legs. All dogs underwent surgery prior to the study. According to the study, dogs receiving low-level laser treatment after their surgery walked a week earlier than the control group. While many dogs with TIDD are treated with steroids, it's not the therapy of choice these days. Steroids do help in the short term by decreasing swelling of the spinal cord, but can also cause ulcers in your dog's stomach. Short-term benefits don't generally outweigh long-term problems. Veterinary Surgical Centers: What Is an Intervertebral Disc? Cimarron Animal Hospital: How Does Laser Therapy Work? What Deters a Dog From Eating?